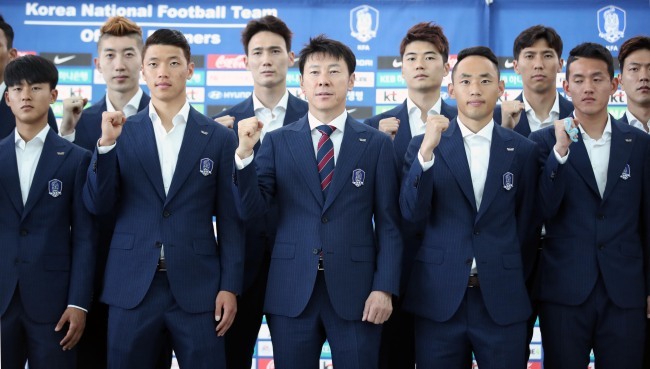 INCHEON -- The South Korean men's national football team departed for Austria on Sunday to set up their pre-World Cup camp, 15 days before their first group stage match in Russia. Head coach Shin Tae-yong and his 23 players will settle down in Leogang, in the state of Salzburg, and play two more tune-up matches there before hopping over to Saint Petersburg on June 12. The Taeguk Warriors' final Group F opponents will be Germany, the defending champions and world No. 1, at Kazan Arena in Kazan on June 27. South Korea are playing in their ninth consecutive World Cup but will be the underdogs in all group matches. Their most recent performance didn't exactly inspire confidence in a skeptical fan base. After downing Honduras 2-0 on Monday, South Korea fell to Bosnia Herzegoniva 3-1 in their final World Cup warm-up match at home on Friday, with their defense badly exposed. Shin carried a 26-man provisional roster to those two earlier matches, and he cut defenders Kim Jin-su and Kwon Kyung-won and midfielder Lee Chung-yong to finalize the 23-player squad on Saturday. The Korea Football Association said the final roster was submitted to FIFA earlier Sunday, a day before the deadline. The coach had originally named 28 players to that provisional team, but two players, forward Lee Keun-ho and midfielder Kwon Chang-hoon, went down with injuries. Shin chose not to replace them.